I took one night not knowing how long I would stay in Hanoi, ended up staying there 4 nights, excellent stay for the price. 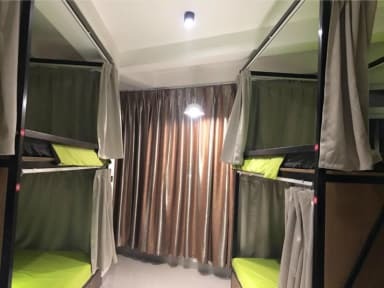 The beds are comfy, room has aircon, privacy curtains, light and electrical outlet for each bed. The location is great, a bit outside of the party places but everything is on walking distance. A big plus: it's situated on a street !food so you can also get something even around midnight or more. Not to mention the staff is extremely helpful and friendly ! Cute little hostel. Beds were comfy and best of all had a curtain around for ultimate privacy. Friendly and polite staff and genuine backpacker vibe. This place was excellent. Clean, close to everything (I walked everywhere), and the staff was super friendly/helpful. I had an early bus (like 7am) to Sapa and one of the staff members gave me breakfast to go without myself even asking. Little things like that really matter to me; I would definitely stay here again. I could not have asked for anything more. Professional, friendly, accomodating are all qualities exhibited by the staff. By the way I lowere the Security rating ao as not to give them a 10. There was absolutely nothing wrong with the security. Really good location in the food district. The breakfast was amazing and the rooms were very clean and the beds comfortable. Thank you to the lovely lady at reception who helped us a lot in preparing the rest of our Vietnam trip! I really liked the location just a short walk from old town. I do t think I would like to stay in old town. It is on a car free street right next to lots of good food. I stayed in a single room. The breakfast is tops. Pho is amazing. The staff want you to feel welcome and have good information to share. It was a safe and sound place to come to on my first trip to Vietnam. Thanks especially to Thu and Cody. The location of this hostel is very good and the staff is very friendly and helpful! We unfortunately can‘t share the good reviews about the breakfast.. The pancakes weren‘t really pancakes, really dry and not tasty. Furthermore we had hair in our breakfast..
Not bad, but not great. Staff was very friendly, knowledgeable and helpful. They provided airport pickup for me at 1am (for a cost). Great location and great breakfast. Stayed in single room and dorm room and both had sinks that leaked. Also a broken shower head, and a broken light fixture - which I alerted to the staff. Not much of a social atmosphere. By no means was this a horrible stay, but there’s a few maintenance projects to be tended to. Private room with ensuite looked nothing like the photos. Vase of dead flowers in room when we arrived, WiFi not working and cockroach in the bathroom.